Inspired from what has been an ever growing trend in Asia, Villeroy & Boch have once again set high trends within the standards of bathrooms. The new ViClean-U and ViClean-L are prime examples. Both are innovative electronic bidet seats, and both have been designed with the ultimate hygiene, wellbeing and convenience in mind. Otherwise known as “the perfect combination of a WC and bidet” the ViClean-U and ViClean-L have been developed with only the top quality and innovative features. They’ve both been fully equipped to meet the highest standards of hygiene and comfort for the ideal comprehensive wellbeing. Villeroy & Boch have gone beyond technology to create the ViClean-U. The bidet section is sublimely clear, yet subtle. Complete with unique balloon jet technology and a particularly comfortable water jet, the ViClean-U is a naturally clear symbiosis of a bidet and WC. The soft, ergonomic air skin dryer is just one of the wide variety of easy adjustable functions that complete the ViClean-U. The built in integrated seat heater allows for optimum comfort and comprehensive well being, as well as the smart automatic lid, which swiftly opens and closes. Complete with an intelligent night light, the advanced sensor technology allows for the ViClean-U to set high quality standards of hygiene and comfort without any making any compromises. The ViClean-L is a clear cut, fresh and innovative feature complete with pure and classic aesthetic features that make a remarkable addition in any bathroom. Every single detail on the ViClean-L has been perfectly designed and formed allowing for superb and innovative functionality. The formation of the ViClean-L also conceals electricity and water connections for pure aesthetics in the bathroom. The customisable and ingenious features also allow for a more personal cleansing experience, as well as appreciating higher standards of wellbeing and hygiene. With their simplistic design inspired by nature, both the ViClean-U and ViClean-L set high aesthetic standards with their delicate and light format. Along with the clear cut compact design, both features also set impressive standards economically. Only using the appropriate amount of water each time one is used, the ViClean-U and ViClean-L both allow for efficient use of resources for the optimum cleaning performance. 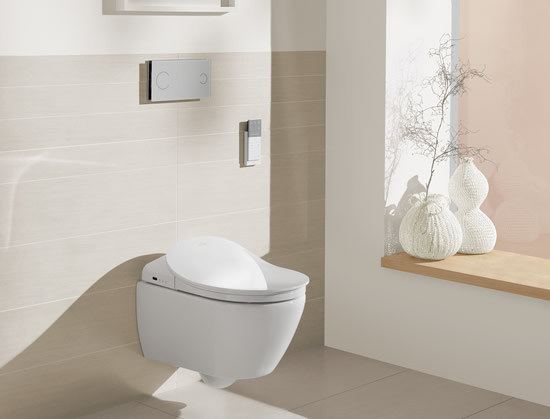 Both have been designed to match the Subway 2.0 WC by Villeroy & Boch, which smartly demonstrates the innovative “New Direct Flush” Villery & Boch have cleverly developed. Combined with precise direct flushing, the open rim provides a stable water flow dynamic around the rim of the bowl, allowing for truly amazing flushing technology without any excess splashing and spilling. Each flush only uses 3 to 4.5 litres of water, both economically use resources in an effective and efficient manner. This entry was posted in Luxury Bathrooms, New Products, Villeroy & Boch and tagged Luxury Toilet, Toilet Flush System, Villeroy & Boch. Bookmark the permalink.